1848: born in Nagoya. His father is a sumô wrestler. 1853: he becomes disciple of the actor Ichikawa Kodanji IV, who is on tour in Nagoya, and receives the name of Ichikawa Yonemaru, playing the role of Goroichi in the drama "Ishikawa Goemon". 1867: Yonemaru settles in Ôsaka and takes the name of Ichikawa Yonejûrô III at the Kita-Horie Ichi-no-Gawa Shibai. 3rd lunar month of 1871: Yonejûrô settles in Tôkyô and plays at Nakamuraza in the drama "Zôhô Senbon Zakura". 1873: Yonejûrô becomes disciple of the zamoto Morita Kan'ya XII, who gives him the name of Bandô Shûchô. January 1875: premiere at the Shintomiza of Kawatake Shinshichi II's drama "Ôgi Byôshi Ôoka Seidan" (commonly called "Ten'ichibô"); Shûchô played the role of Oshimo [casting]. June 1876: premiere at the Shintomiza of Kawatake Shinshichi II's drama "Hototogisu Date no Kikigaki"; Shûchô plays the roles of Goheiji's musume Otsuru, the tsubone Kuretake and Yamana's okugata Sakasai [casting]. 1880: tour in Nagoya with the troupe led by Ichikawa Danjûrô IX; Shûchô plays at the Furusode-Chô Shibai. January 1881: Shûchô achieves a great success at the Shintomiza (Tôkyô) by playing 9 roles in the 2 classic dramas "Yoshitsune Senbon Zakura" and "Sugawara Denju Tenarai Kagami". February 1884: Bandô Shûchô takes the name of Bandô Shûchô II at the Shintomiza. February 1885: Shûchô takes part in the opening ceremony of the Chitoseza [more details]. Premiere at the Chitoseza of Kawatake Mokuami's drama "Suitengû Megumi no Fukagawa"; Shûchô plays the role of Ogiwara's wife Omura [casting]. May 1890: Shûchô plays at the Shintomiza the roles of Oyoshi and Omine in the drama "Jitsuroku Chûshingura". March 1891: premiere at the Kabukiza of Fukuchi Ôchi's drama "Buyû no Homare Shusse Kagekiyo", a revised revival of Chikamatsu Monzaemon's jidaimono "Shusse Kagekiyo"; Shûchô plays the role of Akoya [casting]. January 1892: premiere at the Kabukiza of Kawatake Shinshichi III's drama "Shiobara Tasuke Ichidaiki"; Shûchô plays the roles of Kakuemon's wife Osei and the goke Okame [casting]. 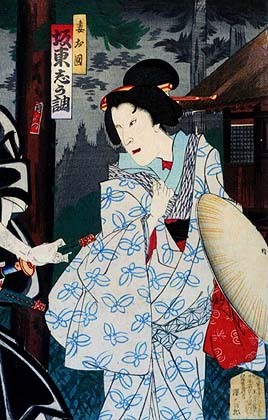 July 1892: premiere at the Kabukiza of the drama "Kaidan Botan Dôrô", adapted for Kabuki from a famous Rakugo story created by San'yûtei Enchô; Shûchô plays the roles of Okuni and Omine [casting]. November 1893: Shûchô plays at the Minamiza (Kyôto) the role of Masaoka in the drama "Jitsuroku Sendai Hagi". May 1898: premiere at the Kabukiza of Kawatake Shinshichi III's drama "Edo Sodachi Omatsuri Sashichi"; Shûchô plays the role of Kan'emon's nyôbô Otatsu [casting]. March 1901: Shûchô achieves a great success in Ôsaka at the Kadoza by playing several roles in the dramas "Ura Omote Date Zome Kosode" and "Imoseyama Onna Teikin". April 1901: Shûchô appears on stage for the last time, at the Misonoza in his hometown (Nagoya), playing the roles of Sagami and Oyumi in the dramas "Ichi-no-Tani Futaba Gunki" and "Keisei Awa no Naruto". Bandô Shûchô II was not a good-looking actor and his diction was not great but he nevertheless succeeded in making a great career as an onnagata. He excelled in the roles of sewamono house wives. His stage partners were the best Meiji tachiyaku like Ichikawa Danjûrô IX, Onoe Kikugorô V or Ichikawa Sadanji I.